Births announced this week are: James Joshua Muntz, Feb. 6, son of Eric and Julie Muntz; Alyssa Jo Rice, Jan. 25, daughter of Bradley Aaron and Ashley Marie Rice. Now open for business: Thorobred Sportswear, Harrison Square. Owners are Mark and Tiffany Kellione; Valley Radiator, Clintonville Road, Paris, Ky.
Harrison County Tomorrow prepares for World Equestrian Games that will be held at the Kentucky State Park in 2010. Cut flowers are undoubtedly the most popular manifestation of showing your love for someone on Valentine’s Day but potted flowering plants can do the trick, too. Perhaps the potted bloom has the potential to remind your lover that the sentiment lasts all year…but what does it mean if you can’t get it to bloom again? Is your love doomed? Of course not, but here are some tips just in case. The Falmouth Road Homemaker Club began in 1946 under the direction of Elizabeth Donnell, Home Demonstration Agent. The January meeting of Preceptor Omega chapter of Beta Sigma Phi sorority was held on Jan. 7, hosted by Kay Cox, secretary. Member Pat Terhune began the night with a pizza party. Cox called roll with members answering the question “was there a special moment you had during the holidays?” She read the previous month’s minutes, which were approved. Patsy Barnett, treasurer, gave the monthly report, and bills were paid. Births announced this week are: Brooke Mackenzie Bush, Dec. 1, daughter of Lisa and William Bush; Jaxton Blake James, Nov. 29, son of Calvin James and Trista Milner; EmmaLeigha Wayne Nicole Kelly, Jan. 27, daughter of Katherin Kelly; Jaylen Rae Shadd, Dec. 22, daughter of Joseph L. Shadd and Jessie L. Jones; Rylan Wynter Stroub, Nov. 28, son of Shawn and Aliceson (Trimpe) Stroub; Korbyn Blake True, Oct. 21, son of Josh and Nikie True. The Blue Licks Chapter Kentucky SAR and SR will hold a joint meeting and luncheon on Saturday, Feb, 16 at 1 p.m. at the Cynthiana-Harrison County Public Library, 104 Main Street, Cynthiana. SAR EMT Medal and Certificate - Mark Hart; SR Member of the Year - Julian Carter Wills; SR Life Time Achievement Award - Janie Adams Whitehead; SR Veteran of the Year - Gene Porter Fouts; SR Distinguished Service Award - Dr. Larry Leslie; Blue Licks Chapter election of officers, 2020-2022. 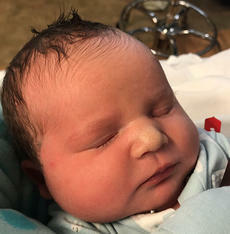 Alden Thomas Gaunce was born to Jonathan and Vonda Gaunce of Cynthiana on Jan. 10, 2019 at Georgetown Community Hospital. He weighed 9 lbs. 4 oz., and is welcomed by his brother Abram and sister Adalyn, and the late Ava Florence. Maternal grandparents are Toni Thompson and the late Jackie Kearns of Paris; maternal great-grandparents are Toni Turner and Stephen Turner of Cynthiana. Paternal grandparents are Michael and Michele Gaunce of Cynthiana; paternal great-grandparents are Kennie and Helen Whitaker of Cynthiana.